The characters include: Annie the mom that's a miniature artist, dad Steve, and two kids Peter the pothead high schooler and Charlie the 13 y.o. awkward creepy budding artist girl. They all live in this large isolated arts-and-crafts-Frank-Lloyd-Wright looking house with beautiful stained glass partitions and hard wood throughout. 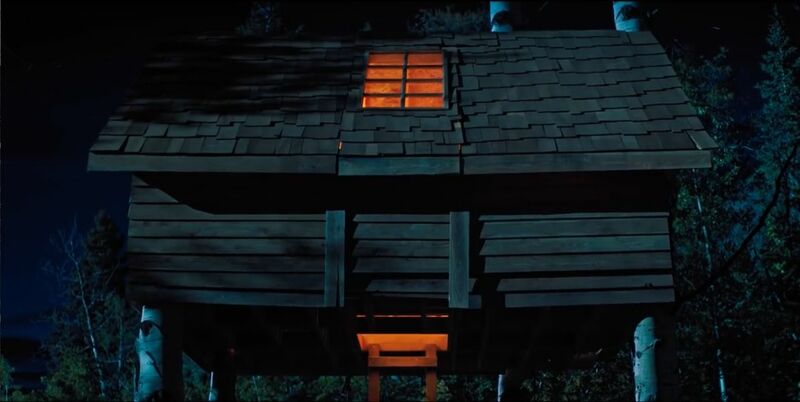 On the outside is a pretty large oddly undecorated and empty tree house except for space heaters. In short, it's a chapel perfect for worshipping a demon. Giant house. I know very few artists that could afford a house like this. Unless her wealth came from worshipping King Paimon? Big 'ol Demon Chapel Tree House. Looks like they're firing up the grill. The first problem I see is BAD feng shui. NEVER have your back or furniture to a window. Both Peter and Charlie's headboards are against the window of their rooms. Oh hell no. That's how things fly though your windows without you seeing them and monsters rip your head off. There's also carvings in some of the rooms of the house, most of them are indistinguishable and they are not explained in the movie. Why would you ruin beautiful wood walls and floors like that?! Headboard against the bottom of the window. At grandma's funeral Annie makes a speech and it's clear she didn't like her mother, she felt she was manipulative, and her mother kept secrets from her... or did she? Both ladies are wearing matching gold pendant necklaces with the sigil for King Paimon, which we come to find out is one of the eight Kings of Hell. (Side note: the symbol used is actually the symbol for Paimon.) Here we also learn that Charlie is troubled, allergic to nuts, makes clicking sounds, was the favorite child of grandma that wanted her to be a boy. Hence her boy's name? Charlie foreshadows her parents death when she asks "Who will take care of me when you're gone?" We never find out if she's mentally disabled or has a mental illness. Oh and she wasn't breastfed by her mother, but by dead grandma! Yep, you read that correctly. Grandma is grooming Charlie to be a King of Hell. Her manipulation has been going on for decades, BUT Annie let her do it. Dead gram with Paimon necklace. Annie records grandma's breastfeeding in miniature form. Annie begins to go through her mother's belongings and comes across a note in a Spiritualism book from her mother saying that they will be "sacrificed". Ok so now we know everyone is going to die in the first few minutes of the movie. Charlie is at school and cuts off the head of a dead bird and has visions of her grandmother. Why does she cut off the head? I don't know, foreshadowing again of her being decapitated? Her mother forces her to go to a party with her brother where she has a reaction to eating walnuts in cake. Couldn't she tell there was nuts after one bite of the cake? I feel like being 13 is old enough to check about food you're allergic to before eating it, unless the demon is already in her trying to kill her body. Anyway, her throat starts to close so she grabs her stoner brother to drive her to the ER. On the way she sticks her head out of the window for air and gets decapitated. Peter comes home and just goes to bed. What the actual hell?! This family def has a problem with communication. Annie discovers her daughter's body when she goes to use the car. Later in the movie Annie says, "My daughter was killed." Which makes it sound like murder, maybe that's just me. Seems like Annie knows there are other forces at work. There's a phone call that grandma's grave has been desecrated, but Steve doesn't tell his wife and she lies and says she's going to a movie when she's really going to a support group for Loosing a Loved One. The family doesn't communicate and they are breaking down. Both parents are on prescription meds too. We find out Annie has a family history of mental illness. But do they really or is it all just the satanic demon trying to possess them and they purposefully kill themselves so he doesn't? Or are they doing it in sacrifice to him? Are they just passing down grandma's mental illness? We don't know. She makes a friend in the group named Joanie that is awfully friendly and pushy. In my mind, she's immediately a suspicious character and forces Annie to be part of a seance. Joanie then gives Annie instructions on how to conjure her daughter through ritual seance, but it's all in a foreign language that even Joanie admits to not knowing...supposedly. Later we find out she was part of grandma's cult all along! Not surprising. 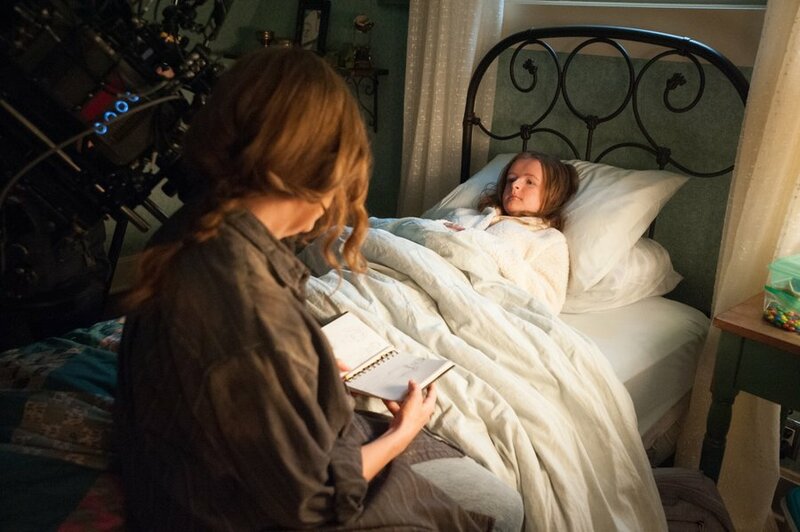 After Charlie dies Peter starts having visions and Annie's dreams are even stronger. She sees Peter dead and admits she wanted to abort him, but grandma forced her to have him. I'm feeling a Rosemary's Baby vibe about this. Did grandma know that Peter would end up being the demon's vessel? 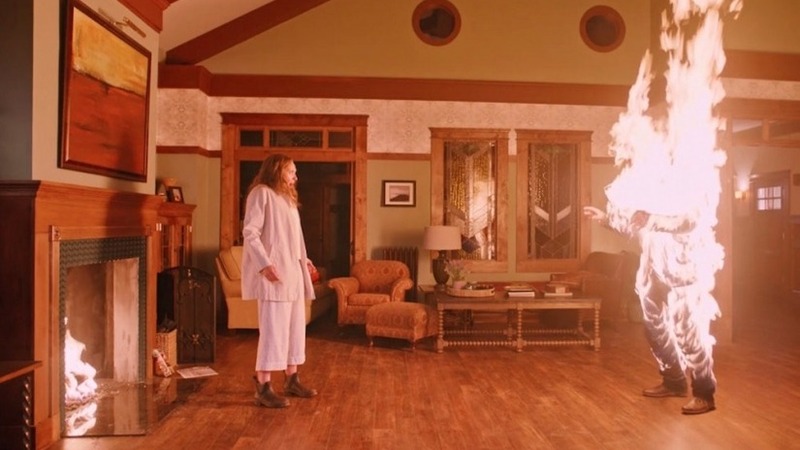 Annie performs the seance and Charlie enters her body, but the cult knows that Charlie needs to be in a male vessel. 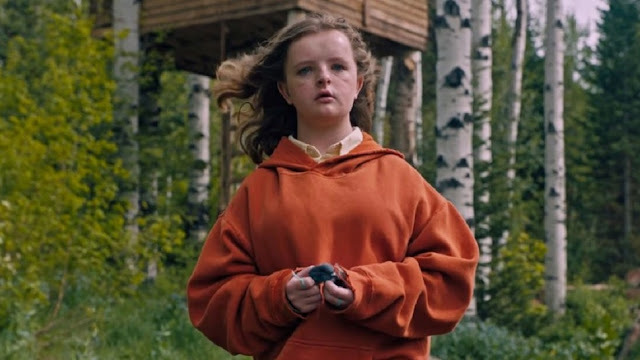 Annie wants to "fix" things and feels by burning Charlie's sketchbook her spirit will go away, but in burning it, it incinerates Steve, not before he accuses her of digging up her mother. Is this the plot twist? Annie really is part of the cult and her personality has split and the part the audience sees is her not wanting to be part of the cult? Then why is she wearing the Paimon necklace in the beginning of the movie? The husband is hot stuff. 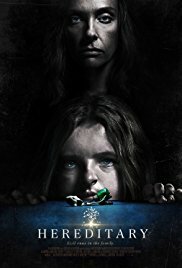 To find answers she goes through more of her mom's things and opens the attic only to find the decapitated body of her mother surrounded by candles in a vigil. How did she know to go in the attic? How could they not hear people in the attic dragging a dead body up there? Was it the King of Hell that put her there? With all those candles that's a huge fire hazard! Is Annie really the one doing all these things? Does she not know she's doing them? Is she doing them while sleepwalking? By the end Annie is fully possessed, climbing on the ceiling, pounding her head against the attic trap door, and sawing off her own head. What's with the heads? Charlie's demon spirit is now in Peter because she had to be in a man to claim the throne as one of the eight Kings of Hell, Paimon. Gram was in a cult that worshipped Paimon and she manipulated her whole family to resurrect him, plot sort of explained. Then the movie ends with cheerful music. I thought this was an odd choice. 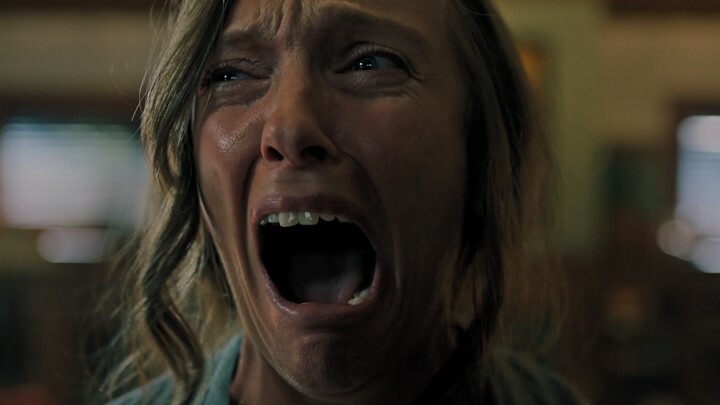 Hereditary doesn't feel like a horror movie. It feels like a family drama with creepy miniatures. A SUPER drama. 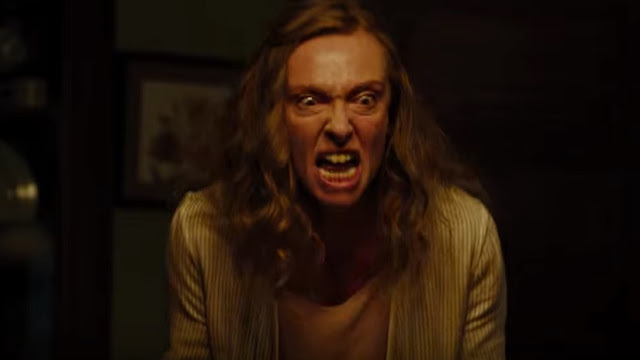 Mom is completely unhinged and there's a lot of extreme over acting, she's a complete husband fire...er dumpster fire. I guess Toni Collette is a good actress? It was entertaining, visually pretty, but some parts took themselves too seriously and were laughable. I laughed and the rest of the audience laughed. I give this three severed heads out of five. Maiden, mother, and crone and a big loud groan. Maybe I need to watch it again, but not anytime soon. Mom needs to chill. After all she knows her family will be dead soon. p.s. The family dog dies, but they don't show how.